We have a lot to be thankful for around here and we don’t mind borrowing an American holiday as an excuse to celebrate, (especially if said holiday centres around a giant feast of roast turkey and pumpkin pie). Since the Thanksgiving tradition of eating absurd amounts of food with the people you love just so happens to be our favourite thing to do, it only felt right that we find the best spots in Brisbane to indulge in all of the classic Thanksgiving trimmings this fourth Thursday in November. Man, do we need to give thanks for Buffalo Bar. This Brisbane City base of good food and good times has been bringing all things American down under since the beginning and, of course, they know how to celebrate Thanksgiving right. Those short on time should at least swing by at lunch for a roast turkey sandwich but the main event starts at 6pm when Buffalo Bar host a full, three course, Thanksgiving dinner. Springwood’s monument to the excessive but glorious indulgence that makes America great, (and England okay and France terrible) there’s no more authentic place for a proper American Thanksgiving than the American Bourbon Bar & Grill. Also promising a traditional, three-course, Thanksgiving dinner, these purveyors of fine barbeque and burgers are including an international wine tasting with host Sharon Moller, just to make sure that you’re extra thankful. A little slice of North Carolina in Morningside, Carolina Kitchen quickly captured the attention of locals who couldn’t resist lining up for a BIG slice of pie. 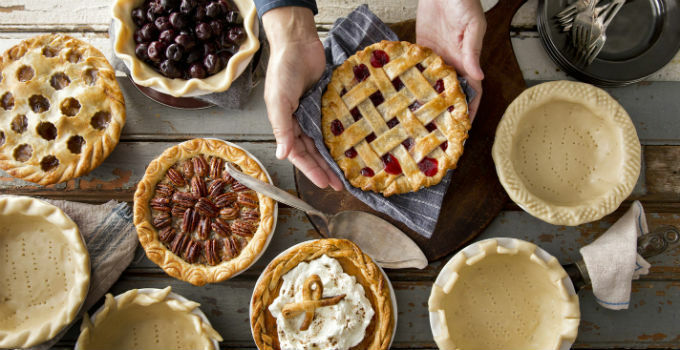 Their cherry, pecan and key lime pies are the stuff of legend and this year they’ve announced that you can pre-order pumpkin and sweet potato pies for Thanksgiving. Be sure to get in quick, everyone on the east side is going to be demanding one. Speaking of authentic, American pies, Fish Lane’s Pie Town are breaking out of their shell (crust?) this Thanksgiving for Thanks – A Pie Town Thanksgiving Feast. Not only are they bringing the turkey, sweet potatoes, cornbread and pumpkin pie that make Thanksgiving, you know… Thanksgiving, but 10 per cent of all proceeds will be donated to the Sisters Inside Supreme Court Bail Program. Good on you! Check their website to see when they set up shop at Wandering Cooks. From the Barbeque Belt to the Beatnik Belt (aka West End) Original Dave’s smoke a brisket so good that it’ll make you stand and sing the American national anthem with pride. This November 22, these masters of southern barbeque are replacing the brisket with turkey for their own American Thanksgiving Dinner. That’s right, when everyone else is roasting, Original Dave is slamming a smoked turkey on the dinner table, along with all of your Thanksgiving favourites. We’re thankful for all of these amazing Thanksgiving treats around town, let’s just hope our waistbands are strong enough.